The Akzium managed services team has over 20 years of hands-on experience with the IBM Power systems running AIX, IBM-i and Linux operating systems, PowerHA as well as virtualized systems running VIOS and PowerVM. Our NOC teams monitor hosted systems 24x7x365 with live follow the sun support. Our monitoring tools alert the team to "out of normal scope" conditions and our ticketing system begins alerting the appropriate resources. Whether you're in need of hosting your CBU system in one of our colocation facilities or wanting to rent a fully managed system or a virtual "slice" of one of our managed systems, Akzium has a wide range of options to fit any size budget. Akzium offers offsite backup and recovery services, managed replication, managed colocation, managed tape, managed VTL replication and recovery and can customize a hosting, redundancy or backup and recovery solution that meets both your business needs and your budget. The VIOS is part of the PowerVM® Editions hardware feature. The VIOS is software that is located in a logical partition. This software facilitates the sharing of physical I/O resources between client logical partitions within the server. The VIOS provides virtual Small Computer Serial Interface (SCSI) target, virtual Fibre Channel, Shared Ethernet Adapter, and PowerVM Active Memory™ Sharing capability to client logical partitions within the system. The VIOS also provides the Suspend/Resume feature to AIX®, IBM® i, and Linux client logical partitions within the system. A dedicated logical partition is required for the VIOS software solely for its use. 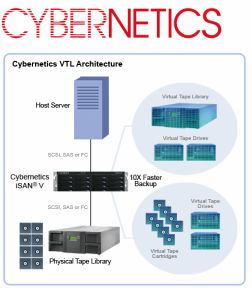 Cybernetics began shipping virtual tape libraries in 1992 that supported SCSI, bus and tag and ESCON fiber channel interfaces and with their experience with tape emulation were able to develop a VTL to connect to IBM's AS/400 platform which even supports IPL. In addition to support for native IBM i backup commands the Cybernetics VTL supports BRMS as well as Robot/SAVE. The Cybernetics Virtual Tape Library (VTL) is one of the very few VTLs that an IBM AS/400 can use as a boot device for a full system restore from a 21-SAVE virtual tape. Fast - Writing backup data disk-to-disk is much faster than writing direst to tape. Restores from virtual tape archives can be initiated instantaneously and also operate at disk speed. Cybernetics VTLs are capable of ingesting and storing backup at over 4 TB/hour. Saves Time - You can execute multiple backup jobs concurrently to independent logical libraries to reduce overall backup time. The VTL copies backup data to tape as a background task without requiring use of your backup software. Directly attached tape devices involve no network traffic. Offload to tape is also efficient, operating at the rated speed of the tape drive. Less Data - Advanced byte-level, hardware-based deduplication reduces the disk space needed to hold backup images. The space reduction is typically over 98% of the original size, giving you the ability to store more backups in less disk space. Thin-provisioning of virtual tapes also helps to minimize disk space usage. At typical data deduplication rates, a single VTL chassis can retain for immediate restore the equivalent of over 1,000 TB of backup storage in normal expanded form. More Connectivity - Cybernetics VTLs offer more host and device interfaces than other systems- including iSCSI, SAS, and SCSI, 10 Gb Ethernet and Fiber Channel on the iSAN® V Series. They also have SCSI-to-iSCSI or SAS-to-iSCSI converters available so virtually any device can be connected. Business Continuity/Replication - Cybernetics VTLs support replicating data to a remote location. replication of deduplicated data is feasible over even a modest bandwidth connection. The system automatically manages copies of data at the primary and replication site. Compatible - Use your existing tape backup processes, software, and equipment. Cybernetics VTLs work with any standard tape drive or tape library for emulation and output of backup images. You can specify the output destination down to individual slots. Cybernetics VTLs can work with any existing architecture, even mixed operating environments concurrently. Storage-based replication for your IBM System-i may seem counter-intuitive to old school AS/400 system administrators who have built upon the IBM System-i disk management facilities associated with AS/400 internal storage, but the IBM System-i has long supported connectivity to Fiber Channel SAN storage including IBM's own StorWize V3700/V5000/V7000 and DS8000 as well as many third-party SAN storage devices. By leveraging PowerVM, the virtualization hypervisor for IBM's Power Systems, and Fiber Channel-attached storage it is possible to leverage the power of storage based replication functions to asynchronously mirror your System-i to a remote SAN storage array and provide ease of disaster recovery. In addition to replicating your IBM AS/400 to a remote location, SAN storage can also be leveraged to provide near-zero-downtime backups including a full system save. By using SAN technology, it is possible to bring your AS/400 into a restricted state to ensure data integrity, perform a SAN "snapshot" of your production logical volume(s), and then immediately bring your AS/400 back online while using a virtual LPAR on your system to mount the snapshot and perform the backup or system save job(s). 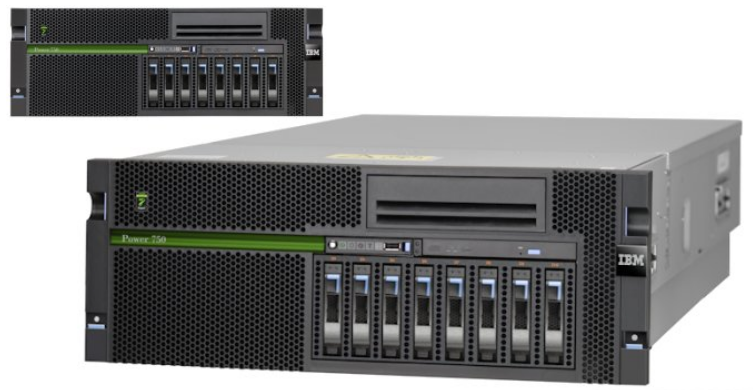 Vision Solutions is the parent company behind the Mimix and iTera replication products for IBM's AS/400 (System-i) platform. Both Mimix and iTera give you the ability to do near-real-time replication of your AS/400 infrastructure using remote journaling facilities built into the operating system. For customers needing 24-hour availability and near-zero downtime, leveraging the Vision family of solutions for your AS/400 can help with both. Whether you are replicating locally to an LPAR for the ability to perform zero-downtime backups or remotely replicating over a WAN for High Availability, the Vision Mimix and iTera products enable increased uptime for your mission-critical applications. Akzium provides a cloud-based version of Mimix, a pay-as-you-go DR solution for your AS/400. Rent a "slice" of one of our Power systems and asynchronously replicate all of your mission-critical data to our hosted system. Differing levels of failover and recovery are available to meet your Recovery Time and Recovery Point objectives. Don't want to dedicate internal resources to managing the Mimix replication? No problem, Akzium offers Mimix as a managed services, so our Mimix specialists monitor your replication and alert you to out-of-sync conditions as well as assisting with recovery and re-sync of journals.